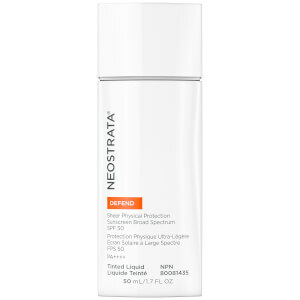 Broad spectrum SPF 50 protects against photodamage, the primary cause of signs of aging. An ultra-fine transparent mineral sunscreen in a virtually invisible universal tint smoothes imperfections and helps natural skin tone appear more even. Multi-Antioxidants Vitamin E and Lactobionic Acid fortify skin’s natural defense, scavenging free radicals brought on by daily environmental aggressors before they can cause premature aging. A PHA/ Bionic complex helps prevent collagen breakdown to maintain a healthy skin matrix and firmness, and helps prevent signs of photoaging such as lines and wrinkles. A highly purified and concentrated form of Green Tea Extract reduces cell breakdown and helps protect cellular DNA for healthy skin. Suitable for all skin types. Fragrance-free and oil-free. Non-acnegenic, non-comedogenic. Shake vigorously for at least 15 seconds before each use to ensure uniform product consistency. Apply liberally to face, neck and other exposed areas, 15minutes before sun exposure. Inactive ingredients: Aqua (Water), Dimethicone, Isododecane, C12-15 Alkyl Benzoate, Hydrogenated Polydecene, Butyloctyl Salicylate, Gluconolactone, Styrene/Acrylates Copolymer, Alumina, Ammonium Hydroxide, Lactobionic Acid, PEG-9 Polydimethylsiloxyethyl Dimethicone, Phenethyl Benzoate,Nylon-12, Tocopheryl (Vitamin E) Acetate, Epigallocatechin Gallate (EGCG), Polyhydroxystearic Acid, Ethylhexylglycerin,Isohexadecane, Tocopherol, Dimethicone/PEG-10/15 Crosspolymer, Dipropylene Glycol, Disteardimonium Hectorite, Magnesium Sulfate, Methicone, Propylene Carbonate, Sodium Citrate, Triethoxycaprylylsilane, Sodium Bisulfite, Phenoxyethanol, CI 77491 (Iron Oxide Red), CI 77492 (Iron Oxide Yellow), CI 77499 (Iron Oxide Black). I've recently had the CO2 laser facial treatment and needed a 50 spf broad spectrum facial lotion to apply daily. I've tried a few, but this one is very nice. It does not itch nor feel tight after application. It seems to have some moisturizing benefit to it. Comes out of the bottle tinted, but dries to a clear matte finish. Make-up goes on smooth on top of the lotion. It must be shaken 15 seconds prior to application. It works in protecting my skin. I would highly recommend. If I didn't know this was sunscreen I wouldn't believe it. Non-greasy formula is great alone or under makeup. I don't feel as if I'm wearing a mask on my face as some lotions have in the past. Will repurchase.